Deemed the car of the future, Ford’s 2015 F-Series Super Duty is one heavy-duty pickup originally introduced in 2006. This car leader has improved its performance while spotlighting on the turbo fuel systems and offers a new King Ranch version, which is Texas inspired. The only car manufacturer to produce their own transmission assortment, along with its diesel engine, Ford promises that their Super Duty 450 will labor effortlessly with all vehicle adjustments and chassis constitutes. Ford had an improved performance wish list for this powertrain and they were able to deliver a hefty turbocharger to allow more airflow and supremacy while lessening the intricacy of the engine. An added benefit is that having a turbo which is larger, provides a better performance of the engine exhaust braking, which is simply initiated by pushing in the button on its dashboard. The deterioration of the wheel brakes are reduced by the additional braking control. This also allows the driver to apply less of an application on the brakes, particularly if driving downhill. The positive enhancements made to the turbocharger also benefited the fuel structure, such as an elevated pressure fuel pump which distributes an increase of fuel when needed for more power. Another fine feature is that the fuel injector tips now separates fuel so it causes a healthier combustion which provides less noise and a quieter vibration. You also have fresher emissions and less accumulation of fuel which can remain on the valves. Another great addition is the Super Duty’s temperature sensor which allows for more precise fuel management, which in turn improves the vehicle’s general ease of driving and its resilience. This can be extremely beneficial when towing. While the fuel system ensures more fuel is achieved to accommodate for needed power, more improvements were made to ensure a great fuel economy such as large brakes, which also includes wheel brakes, anti-lock brakes and the parking brake. 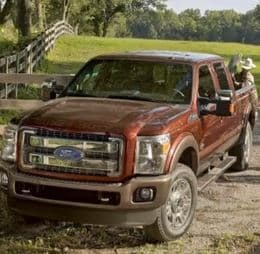 Ford is also luring its customers with their latest updates to their 2015 King Ranch model which are known to combine Texas-extravagance with the reliability that Ford vehicles are known for. Primarily these updates are for cosmetic purposes as you will see on the vehicle’s exterior which uses a dimmer version of Caribou on the bumpers and lower area and inside the seats. The running boards are painted black and the squiggly “W” insignia is stitched in the seats to appear as it was branded.